Underwater ambient light and correcting filters can only take you so far. With light and color loss starting after just a few feet, successful videographers often rely on quality lighting to reproduce the colors and beauty of the underwater world around them. Choosing a video light can be challenging in a market saturated with options. Check out our recommendations below for a variety of high quality, feature rich video lights. Important things to keep in mind when shopping video lights is your desired end result and shooting locations. Will you be diving deep or shooting where there is lots of bright light? This will affect the lumen power you're looking for. Are you shooting a wide angle lens and need wide beam coverage to match? Do you want a versatile light with added features like a narrow beam (often used to signal buddies as a dive light), a red beam (for helping the camera focus without scaring shy marine life) or creative options such as UV leds. Choose the light that best suits your shooting needs and price point. The Kraken Sports Hydra 5000 S+ Video Light is a high performance video light at a lower price point. It can be used as a universal light as it features a spot, flood, red and UV beams. In addition the light offers a strobe mode, emitting a more powerful burst when connected to the camera via a fiber optic cable. It can also be controlled by an optional remote control from Kraken Sports. 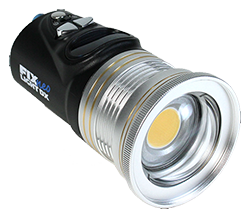 The Fisheye Fix Neo Premium 4030 EF II Video Light is an awesome video light packed with great features. It offers a 3,000 lumen output with 120° beam angle provided by domed port. The light dispersion is even and does not create any hotspots. The light is easy to use and flexible - allowing for power adjustments from 0-100 in 1% increments. One great feature of the light is the Electronic Flash Mode. When connected to your camera via fiber optic cable, the light can emit a powerful burst similar to a strobe, perfect for grabbing a quick photo during your video shoot. Electronic Flash Mode produces 4000 lumen burst. 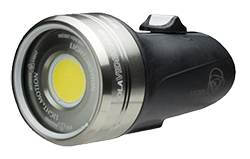 The Light & Motion Sola Video 3800 Flood Light is a super compact, high quality video light. It features a bright 3,800 lumens and an even quality light beam produced from high end LED's. Simple to use with a unique magnetic slider switch and fully sealed to prevent flooding the light is perfect for travel and able to take a beating through continued use. The Big Blue VTL3500P Video Light offers power in a small and compact body. It features both a wide and narrow beams making it versatile. In addition, it also has a double o-ring design which adds security against flooding. One outstanding feature of the video light is its battery life. It could reach 1.5hrs of burn time at full power. 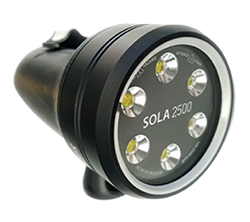 The Sola Light & Motion Sola 2500F Video Light is a high quality, tiny video light perfect for all levels of photographer. 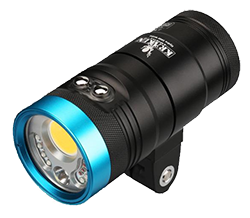 This exclusive Bluewater light, perfectly priced, features a bright 2,500 lumens and is easy to control through the unique Sola magnetic slider switch. The fully sealed design and rechargeable battery make for a safe and secure system. The small size is perfect for traveling.